If you haven’t seen folk dance in Mexico, you haven’t seen Mexico. While many of us raised north of the border were taught the Mexican hat dance in elementary school, the version we learned is only a pale imitation of the dances that are entrenched in the culture of cities, towns and villages throughout Mexico. Specific dances vary from state to state and region to region, but in general Mexican folk dance encompasses joyous music with a heart-like beat, bright costumes (almost always including distinctive head gear), extremely fast foot work and a simple but charming story. We first learned about real folk dancing in Mexico many years ago in the beautiful Palacio de Bellas Artes in Mexico City. The Ballet Folklórico de Mexico, originally organized by Amalia Hernández in 1952, was a magnificent introduction to the various types of folk dance in Mexico and whetted our appetites for more. We assumed that, as we travelled throughout the country, we would be able to simply check newspapers for performances of local dancing – an assumption that, like many of our other uninformed views of Mexico, did not prove to be true. Most of our folk dance experiences turned out to be serendipitous. On one drive south from the U.S. to Huatulco we stopped in the city of Uruapan in the state of Michoacán, and while exploring the historic center we heard music from the central plaza and saw a small crowd of people laughing appreciatively. We joined the crowd and saw the extremely funny and intricate “dance of the little old men” (la danza de los viejitos). The dancers, wearing bright-colored serapes, hats with colorful ribbons and masks of aged faces, challenge each other to dance faster and faster to belie their elderly status. The onlookers, including us, were moved to clap vigorously and shout encouragement as the dances grew more and more frantic … a reaction that the vast majority of good folklore dances evoke from the audience. In Tuxtla Gutierrez, Chiapas, in search of excellent tamales, we were advised to go to the restaurant Pichanchas in Centro that as a bonus provides marimba music. When we arrived we were told that there would be a show including dancing. That was our introduction to folklórico Chiapaneco. For several of the dances, the women wore the absolutely magnificent colorfully embroidered dresses characteristic of Chiapas and appeared to be brilliant butterflies. And a charming little courtship dance was delightful, especially the ending kiss modestly taking place behind a large sombrero. Watching Oaxacan folklórico can actually be planned since there is an annual folk dance festival, the Guelaguetza, that takes place every July in the city of Oaxaca. (“gue” is pronounced as in “guest”.) Groups from all over the state, including a dance troupe from Santa Maria Huatulco, participate. Unfortunately, we have been so involved in theatre and concerts in the U.S. in July, we haven’t made it down for this event. However, driving one night in Huatulco, we heard wonderful music coming from Plaza Chahué and stopped to see who was playing. A commercial convention had set up its tables and chairs in the plaza and a folklórico group was dancing in the middle. They were wonderful. Uninvited, we sat anyway on a nearby wall and enjoyed the whole performance. 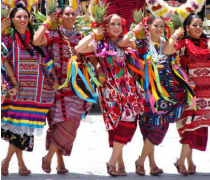 Most memorable of Oaxacan folk dances is the pineapple dance, in which the dancers hold a pineapple on their shoulders or place the pineapples on the ground and dance around them. A friend who was born and raised in Oaxaca told us that many Oaxacan children learn the pineapple dance, and the dance is often part of wedding and other celebrations. When amateurs perform this dance, instead of using real pineapples they decorate yellow balloons with green paper to imitate the pineapple leaves. The dance with real pineapples is exciting, and the possibility of popping the balloons must increase the excitement. Last month we returned to Mexico City to update our knowledge of the Ballet Folklórico de México. The performance was even more wonderful now than before. Since the group has a repertoire of 80 dances and only performs nine or ten at each concert, we were able to see some that we hadn’t experienced before. The one dance that we had seen previously, and in many ways the most unusual, is la Yaqui people’s Danza del Venado (the deer dance). Incorporating just three dancers, two hunters and the deer, the story of the hunters tracking and finding the deer, the deer’s frantic but futile attempt to escape, and its death throes, was performed with such virtuosity that the audience gasped as the deer heaved and took its final breath. All of the other dances were much more upbeat and were performed by many members of the company. All were sheer perfection in synchronized movement and music. All the costumes were breath-taking. Yet each dance was unique. There were nine dances and here are some highlights. The first dance, Los Matachines, which originated in pre-Columbian times in the area now called Mexico City, began with drummers dressed in pre-Hispanic costumes, including large horizontal feathered hats and bright pink stockings, rapping out a very loud beat that felt as if the purpose was to raise the heartbeat of the audience. The drums were echoed by the stomping feet of the dancers and the gourds they were shaking with the same rhythm. We and the rest of the audience were immediately captivated. One of the dances that has emerged more recently honors the women who fought side by side with the men in the revolution of 1910. The dance first features the women, who provide a striking tableau carrying their long rifles, and then they are joined by the male fighters. The dance then shifts to elaborately dressed aristocrats at a ball frivolously dancing away the hours under gold and crystal chandeliers – until the revolutionaries break up the party and take over the dance floor in a celebratory finale. Perhaps the most visually stunning performance was the Danza de Los Quetzales from the state of Puebla. The brilliantly-colored feathered head-dresses form vertical circles measuring at least 2 meters across, yet the dancers gracefully portray the mythic quetzal birds and seem to soar. The dance also originated in prehistoric times and still is performed by dancers in Puebla who practice for months to be able to navigate with the cumbersome but entrancing head gear. The dance that evoked the most ebullient reaction from the audience was the Fiesta in Tlacotalpan. The beat is Caribbean, the dancers perform fandangos and then are joined by huge mojigangas – enormous doll-like figures that are drawn from village legends. The drums and dancing create an atmosphere of Mardi Gras, and when the dancers and mojigangas come down the aisles into the audience, the house erupts in loud clapping. Remarkably, the audience at this performance was not moved to stand and join the dancers. Another fiesta dance, Fiesta in Jalisco, always closes the show. The mariachi musicians are as good or better than any we’ve heard in Guadalajara. The dances ranged from pure ballet duets to extremely intricate traditional dances involving the whole company – including the Mexican Hat Dance which looked nothing like our U.S. elementary school version. At the end of the fiesta, we and the rest of the company applauded until our hands were red. We hope we have given you a taste of folk dance in Mexico. But since this art form needs to be seen rather than read about, we urge you to watch it on your own. The Ballet Folklórico de México is worth a trip to Mexico City all by itself and has a performance at least twice a week on Wednesday nights and Sunday mornings. Or, if you happen to encounter the local Oaxacan dancers who represent Huatulco at the Guelaguetza, spend some time watching and listening.